Well, the kids are less sick, and the workmen aren't here today banging around the upstairs bathroom. So here (finally) are the updated Movement rules. I'm sure they'll need some more expansion/cleanup later, but I wanted to get them out to everyone so that I can get back to the Shooting rules. Compared to most other tabletop wargames, movement in M42 is extremely simple. Tactically however, movement is also extremely important. As the positions of your units relative to the enemy will determine how far they can see, and how difficult they will be for an enemy to hit with ranged weapons. How far a unit may move is determined by a combination of a unit’s Movement (Mv) characteristic, the terrain that unit is crossing, and it’s current Action. The models in a unit performing an Advance action may move up to that unit’s base Mv characteristic, in inches. While in a unit performing an At The Double action, each model may be moved up to double the unit’s base Mv characteristic. If a terrain or obstacle is considered to be Clear Going, then crossing it does not affect the unit’s movement at all. Slow Going terrain or obstacles will prevent units from running across them freely. Forcing them to move more slowly in order to maintain their formation. A unit may not move At The Double when any of it’s models are crossing Slow Going terrain or obstacles. Terrain or obstacles which are considered to be Difficult Going do not restrict a unit from moving At The Double. But they will slow the movement of individual models crossing them by one-half, rounded down. Note that a particular a terrain piece or obstacle may be considered either Slow Going, Difficult Going, or even both. Some obstacles simply can’t be crossed in the heat of battle. If an obstacle is considered Impassible, then no models may enter, land on, or cross it in any way. Models in your own unit will always step aside to make way for their fellow troops. You may therefore move through models in the same unit without penalty. Models from other units in your Task Force will also allow you to pass though them. However any such movement is always considered to be Slow Going. In either case, a model may not end it’s movement on top of another friendly model. They’re not going to be that accommodating! The enemy is not going to simply stand aside as you attempt to move past them! Obviously, it’s harder for a unit to climb a hill than it is to run down the other side of it. A unit approaching a hill also has to be wary of what they might find on the other side, and move cautiously. Movement from the table onto a hill, or from one hill-step to a higher one, is always considered to be Slow Going. As is movement that crosses a hill or hill-step. On the other hand, movement from a hill to the tabletop, or from a higher hill-step to a lower one, will always be considered to be Clear Going. Area Terrain of any kind is always considered to be Slow Going for any unit who’s models enter, leave, or cross it. If a Linear or Point Obstacle is 2” or less in height, then it is always considered to be Slow Going. Obstacles which are over 2”, but less than 4” in height, are considered to be both Slow, and Difficult Going. While any obstacle which is over 4” in height is always considered to be Impassible. In M42, Structures represent the walls and floors of buildings. Whether they are intact, or half destroyed, as in a ruin. Models crossing the vertical walls of a structure always treat that movement as Difficult Going. Unless there is a door, window, or other hole available through which to move. 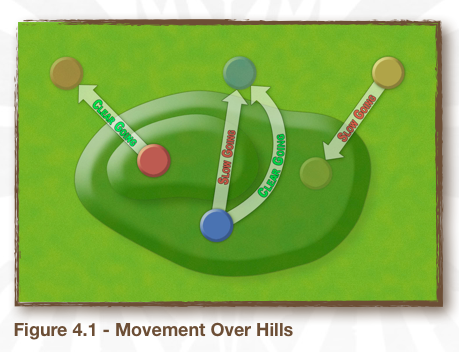 Models moving from a lower level to a higher level in a structure will always treat that movement as Difficult Going. While movement from a higher level to a lower level will always be considered to be Clear Going. Note that some structures will have bases. Which represent Area Terrain. While others do not. If a structure has a base, then models on the ground level will, as per the Area Terrain rules, be in Slow Going. While models on the ground level of a structure that lacks a base will be in Clear Going. Note that a unit is considered to be in Close-Combat if any of it’s models end their moves within 6” of an enemy model. Once the current player’s Action Phase is over, all Close Combats will be resolved in the Close Combat phase. Which has it’s own rules for how models fight, shoot, & move. For the purposes of targeting and shooting, all models in M42 have 2 facings. A Forward Arc in front of the model, and a Flank Arc behind and to the sides of a model. To determine the facing of a particular model, trace a line between the center of the model’s shoulders. Any model in front of that line, or touching it, is in the model’s Forward Arc. While any model completely behind that line is considered to be in it’s Rear Arc. At the end of a unit’s movement, in either an Advance, or an At The Double action, it’s models may be turned to face any direction. Normally, a unit’s models may also turn to face any direction after an enemy unit has been targeted, but before they actually fire. Note that a model’s facing will affect it’s ability to both target and fire upon enemy models which lie within or outside of it’s forward arc. In addition, many units will have different armor or evasion values, depending on whether the enemy model(s) targeting them lie it’s forward or rear arc. When a unit moves, it’s models are required to end their individual moves within Coherency of another model which has already moved. In M42, the standard unit coherency value is 2”. 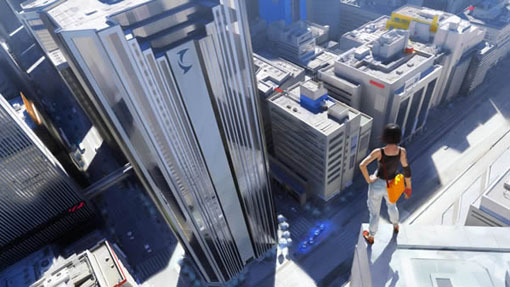 Units with the Leaper special rule are, due to advanced technology, training (Parkour! ), or novel genetics, able to jump effortlessly over obstacles that would normally slow a human. A unit with the Leaper special rule always treats hills, and movement from one level of a structure to another, as Clear Going. In addition, they will treat any obstacle of 2” or less as Clear Going; obstacles between 2” and 4” high as merely Slow Going, obstacles 4” or more inches high as both both Slow and Difficult Going, and obstacles 6” or higher as Impassible. Units with the Limited Vision special rule may not turn at all during an Open Fire action. Units with the Spread (n”) rule replace the normal unit coherency of 2” with the value in the parenthesis.